Shelby Watkins is not just a waitress at Dino Bite Cafe. She wants more than anything to move up in her role in the Amber Beach Dinosaur Museum and be part of fossil digs instead of serving in the restaurant. However, Kendall Morgan, the museum director, does not see things her way. When trying to persuade Ms. Morgan and her two assistants Chase and Koda does not work, Shelby decides to stow away, hoping that it'll persuade Ms. Morgan to let her take a job at the dig itself. Shelby chases after Ice Age and gets an assist from Tyler, a passing explorer. 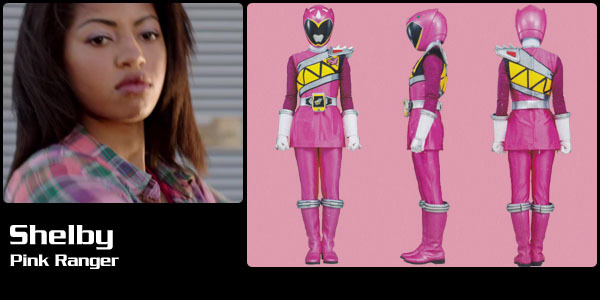 She accidentally finds the Pink Energem, bonding with the Tricera Zord and becomes the Dino Charge Pink Ranger of the Rangers. Dr. Kendall however still trying to find out what made the pink Energem bonded to her. Once they are Rangers, Shelby goes on a dig with the other Rangers for the remaining Energems but she comes up with a new idea in finding them. After some convincing, she and Kendall work on the E-Tracker to find the Energems and end up discovering The Ankylozord was under the control of one of Sledge's monsters, it attacked the Rangers but after accidentally falling in a hole next to it, Shelby was able to sway it to the zord. After Heckyl takes over Sledge's ship, Shelby has been taking business classes on her father's insistence. Her father is the CEO and founder of Watkin's Ice Cream and would like her to take over the business one day. However after a pep talk from Riley, she stands up to her father and reinforces her dream to study fossils which he previously mocked. Mr. Watkins accepts this and apologizes. That same day she discovered co-worker Heckyl was a villain and also Snide at the same time. Meanwhile, her feelings for Tyler has only increased but she hasn't told him yet. When Wishstar granted them wishes, she wished to have a picnic alone with him. Erin, best friend of Shelby's is making the male Rangers laugh at the Dino Cafe. It gets on Shelby's nerves that Erin claims she created or taking credit for things she was not responsible for. A step too far was when Erin claims to be the Pink Ranger in front of television cameras. Shelby says she doesn't want to stop being friends. Keeper asks if she has spoken of her concerns. Shelby responds no. He then asks how can she expect her to change? A monster capture Erin. They save Erin. Erin apologizes to Pink. Erin apologizes not only for being a Ranger, saying she is too nice to say anything but apologizes for taking credit for things she did. Shelby says it is okay. Erin tells the Rangers that the Triceratops song belongs to Shelby and they sing it together. Shelby is excited that one of the singers, Reta of N-Zed will be coming to the Dino Cafe for adding members to the group. She tries auditioning and gets the action of Reta, which makes Tyler jealous. He auditions, chokes and she joins in. Rata asks Shelby on a date and he says goodbye as she says she is busy and she and Tyler hold hands. When other Ranger sincluding Tyler are turned to stone by Badussa, Shelby is helped by Keeper, Phillip and James to make a new zord' Spinozord. They form the Spino Charge Megazord. She learns to have confidence in herself. She is the one to convince Heckyl he has good inside himself. With Heckyl and the others, Shelby helps destroy Snide. After getting all the energems together and reversing time to save Earth, the Rangers defeat Sledge who returned. The Rangers say goodbye to Koda, Ivan and Heckyl that return home. Tyler, Shelby, Kendall, Chase, Riley, James and Phillip return to their time where Dinosaurs now co-exist with humans.